Let’s be honest, one of the most challenging roadblocks that we all face in our journey to achieving our goals is keeping our momentum going. It is hard. There are days that we feel totally no motivation to do anything and we just want to relax and do nothing. So what should you do when you fail to come up with the drive and to keep your momentum going? The majority of people fail to achieve their goals because they fail to stick to their plans. They set goals and they get excited, but just for a short moment. After a few days or weeks, they lose their steam and momentum. They don’t feel as excited as when they first started. Eventually, their momentum dies down and they stop taking action. They abandon their goals or look for something else to do. They start a new project or they just give up and say that goal setting doesn’t work. If this is happening to you, don’t worry because you are not alone. In fact, it happens to me too. There are many times that I wanted to give up because I’m losing the momentum. I wanted to rest and just do nothing. It’s hard. It’s not easy. In other words, to keep achieving and keep making progress, you must maintain your momentum to keep going. Imagine pushing a car. When you first approach the car and push it, you need to exert a strong force and push it with all your might. But once the car started to move a little, it becomes easier. You just need to maintain the force you exert on the car to keep it moving. And if you continue to push the car with all your strength, the car will move faster and faster. This is momentum at works. And when it comes to achieving your goals and taking consistent action each day, the same principle applies. When you first started, it may seem very difficult. You need to put in a lot of energy and effort to get the things done. Like writing an article. If you have never written an article before, writing your first article can be a challenging task. You will feel that it is extremely difficult to do. But if you continue to push on. Things become easier. This is because you have gained momentum and slowly, you get used to the process of doing so. If you write an article a day, after a few weeks or months, it will become a normal task for you. You don’t feel it be to as difficult as when you first started anymore. In other words, the more you involve yourself in a project or a task, the more motivated you will be. The key to building your momentum is simple – you just need to get it moved. Like pushing the car, you just need to put in the energy and get it moved. Once it moved, things will become easy. For example, if you want to build a successful blog, you must then make sure you maintain your progress by consistently publishing blog posts. The same goes for losing weight. If you want to exercise regularly, the key to gaining the momentum is to just do it. It will be tough at first, but once you get over it, it will become easy for you. So here are 5 tips that can help you build and maintain your momentum so that you can stick to your goals. If you want to build your momentum, you must always start small with simple steps. You don’t want to overwhelm yourself with big and difficult tasks. Remember, the key is to get things moving. You want to put yourself in the action cycle so that your momentum will grow bigger and bigger. Thus, start with smaller and easier tasks. For instance, you can break down a bigger task into several smaller ones. As you can see, I break down it down into smaller and more manageable tasks. All I need to do then is to focus on getting the smaller tasks done. When I come up with the article title, I gain a little momentum and feel good what I have done. After I have drafted the article with subheadings, it gives me an idea of how to write the article. I gained more momentum and I felt that I’m making progress, which led me to write the article. And the process went on until I get the article published on my blog. 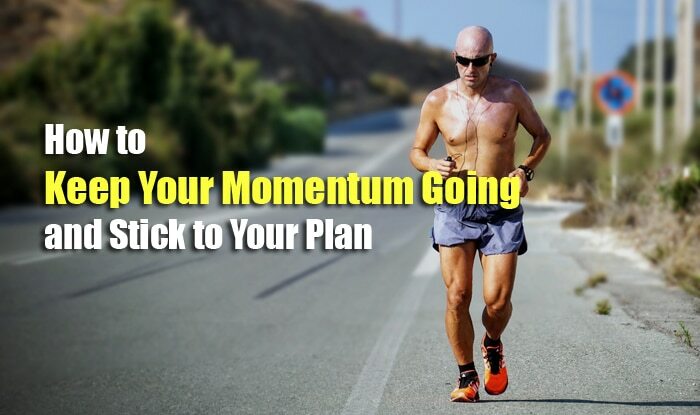 This is what you need to do too if you want to build your momentum. Always start small and break down your work into easier and more actionable steps. You don’t have to work on a task for 30 minutes or an hour if you don’t want to. You just need to do it for 10 or even 5 minutes. The key to building up your momentum is to get yourself involved in the progress. When you take action and make progress, you are in the cycle. The momentum will come and you will want to do more. I know that you may be thinking that celebrating a small task may sound absurd. But I’m here to tell you that it did. Of course, you don’t have to throw in a party just because you work for 5 minutes. What you can do is to give yourself a pep-talk. Telling yourself, “I can do it” after you accomplish a small task can make a big impact on your level of motivation. When you celebrate, you are acknowledging your hard work. You are telling yourself that you’re doing good and this actually gives you more energy to go on. Why do you think athletes celebrate their wins? When they score a point, they celebrate. They know that when they feel good about their small victories, more victories will come. Celebration makes you feel good and helps to build up your momentum. Like I said, you don’t have to celebrate the big way. You can give yourself a pep-talk, make a fist-pump to show that you have won, or just quietly praise yourself in your head. One of the most powerful ways to generate momentum is to involve someone else. First, having a partner or when you involve someone else in your work, it becomes a support system that holds you and your partner accountable. And besides that, you can motivate and keep each other driven to get the things done. Energy is contagious. It can be transferred and it can affect your mood. So when you are at a low energy mood and you don’t feel like doing anything, your partner can then support you and influence your mood. It is better to work together than to work alone. When you can share your experience with someone else, it makes you feel motivated to do it. Therefore, find someone to share your experience with. Hold yourself accountable by sharing your progress and what you have done with your partner. Why do you want to do it in the first place? Many people find it hard to stick to their plan because they don’t have a strong and empowering purpose for what they want. They say that want to build a successful business, but they don’t a strong supporting reason behind it. When this happens, they will quickly lose their motivation and momentum when things become tough. This is why people give up on their goals. When your purpose is strong and exciting, it will keep you going for the long-term. And this is also why the experts often say that you shouldn’t do it for the money, instead, you should do it for the passion. When you love what you do, you will continue to do it even when things are difficult or when you are not getting paid. But if you’re doing it for the money, you will give up soon enough when you don’t earn any money from your work. So what you can do is to come up with a strong and vivid vision for what you want to create. What kind of success are you looking for? What do you want to achieve? Why do you do it in the first place? When you know your why, always keep it in your mind. Visualize and focus on the rewards and your purpose. Your purpose builds your desire. Your desire will build your momentum and give you the motivation that you need to keep going. Instead of thinking about how far you are from your goal, think about how far you have come. Too many of us lose our momentum, happiness, and motivation because we focus too much on the future gap. When we think something like, “I’ll be happy when I reach my goal,” or “I’ll be successful when I’m rich,” this future-gap thinking isn’t working. When you think it this way, you’re postponing your happiness to the future and you will quickly lose your momentum. Instead, choose to focus on the reverse gap. Look at how far you have come and appreciate how much you have accomplished. When you think about all the great things that you have done, all your victories, all the wins that you have created in your life, you feel good almost instantly. This is why this thinking is so powerful. Thinking about your accomplishments actually makes you feel grateful and driven. You will quickly gain the momentum you need and to perform better in whatever you’re doing. Building and maintaining your momentum is extremely important when it comes to achieving your goals. People fail to follow through their plans because they lose their momentum somewhere along the line. Don’t let this happen to you. Apply the 5 tips above to help you create the momentum you need to keep you going. Successful people understand the power of momentum. If you want to achieve extraordinary results in life, you need it. So learn to build your momentum, keep it, and maintain it. When you have momentum, you become unstoppable.